One of the worst parts of summer is the dreaded mosquito bites. It’s fun to be outdoors and enjoy the sunshine. However, no one enjoys having a handful of itchy and swollen bumps. Bug repellents contain harsh chemicals that may be too powerful for the skin, dangerous to use around pets, and not safe for kids. But what if we told you that you could make homemade mosquito repellents? There are plenty of organic ingredients that are known for keeping mosquitoes away. Not only are these ingredients effective, but they also can be made in advance and be taken with you when you’re hiking, camping, or going on a trip. 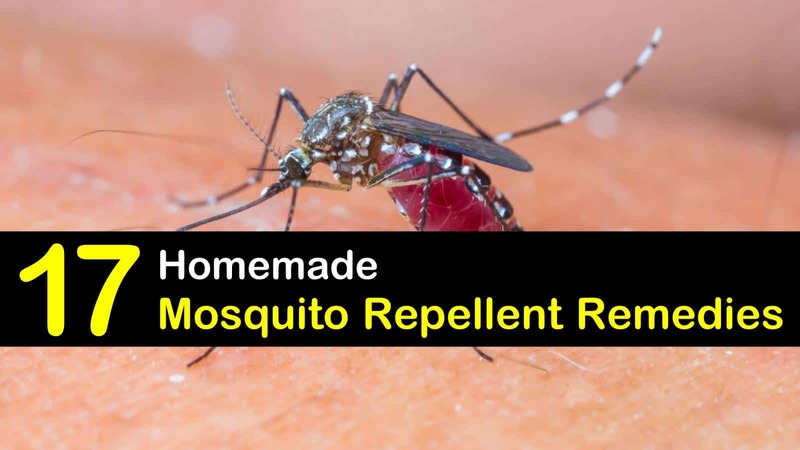 So, instead of having to browse the web for multiple remedies we’ve created a list of how to make homemade mosquito repellent recipes. How to Use Natural Mosquito Repellent? What are the Side Effects of Homemade Mosquito Repellents? Can Natural Insect Repellent Cure Bug Bites? How Long Does Homemade Mosquito Repellent Last? This mixture is the easiest to produce because it uses ingredients that are already in your pantry and make a simple fix for how to keep gnats away outside. Baking soda, or sodium bicarbonate, and vinegar are known to have attractive properties that lure bugs before trapping them. Cut the bottle in half and place the baking soda in the bottom half. Flip the top so that the container is inverted. After this, secure the bottle with tape and pour the vinegar in slowly. Place the bottle in areas of your home that tend to be overrun by gnats or other small bugs. The funnel will prevent them from escaping, and the mixture will kill them. Lemon eucalyptus essential oil is derived from a plant that contains citronella oil and p-menthane 3,8-diol. The property which makes this chemical compound effective is the p-methane, which is very useful as a DIY mosquito repellent. Add witch hazel and lemon eucalyptus oil to the spray bottle and combine. Store it in a dark and dry place. Typically, this mixture lasts a few weeks before you need to make a new one. Apply the solution as needed directly onto the skin. However, do a test patch first. Cinnamon is a powerful herb that is extracted from cinnamon bark. It’s been known to be effective at repelling mosquitos and similar insects. If you’re looking for a spray that is affordable to make, you may want to consider this. Pour water in the spray bottle. Add cinnamon extract. Shake the bottle a few times until the mixture is thoroughly combined. Spray the solution onto your body before leaving the house and reapply as needed. Mouthwash contains multiple chemical compounds that naturally repel bugs. Some of these include eucalyptol, ethanol, and menthol. These chemicals change depending on the brand you purchase, but you will find that a majority of mouthwashes contain these chemicals. Pour the mouthwash and salt in the spray bottle. Mix the mixture until the salt has completely dissolved. You’ll be able to use this spray indoors and out, creating a versatile bug repellant. If needed, you can apply this multiple times throughout the day. Any alcohol mixed with an oil can help prevent bug bites. If you’re looking for a topical cream that you can make at home, then this can be a great alternative to over the counter topicals. Pour ingredients into a spray bottle. Shake until the mixture is well combined. Apply this topical to your body before heading outside It will repel bugs and can even be used to help soothe bug bites you already have. Limonene and citronella are components you can find within lemongrass and are used to repel mosquitos. Rosemary essential oil has strong properties of eucalyptol as well, making it useful repellent. Pour rosemary and lemongrass oil into a squeeze bottle. Add the jojoba oil and mix until all three oils are combined. You may need to shake it multiple times before applying it to your skin. Tea tree oil has numerous benefits and is best known for being anti-microbial. Typically, it’s used as a topical, but others use it as an antiseptic or anti-inflammatory remedy. These properties enable it to soothe and repair itchy bumps while also preventing insects from biting. Combine tea tree oil and coconut oil or olive oil. Mix them until they are combined and then apply this multiple times throughout the day. Lavender oil, vanilla, and lemon each have properties that repel mosquitoes. Limonene, eucalyptol, and camphor can all be found in lavender oil and are effective at keeping bugs away. The citrus in lemon also has a high acid content, which prevents them from biting your skin. Mix lavender oil with vanilla extract in a spray bottle. Add in the freshly squeezed lemon juice before finally adding water. Shake the bottle continuously until the ingredients are combined. Use this bug spray on your skin two to three times a day. A small amount of neem oil is an effective mosquito repellent that can be used in multiple ways. Mixing neem oil with coconut oil will help ensure that it doesn’t damage the skin and prevents further mosquito bites. Furthermore, neem oil benefits for plants ensure that you’re not putting any toxic chemicals that may damage them. Neem oil makes a great DIY mosquito repellent spray for yard. Place neem oil into a squeeze bottle. Mix it well with coconut oil before applying it to the skin. Apple cider vinegar itself isn’t a repellent, but mixing it with essential oils can help. Combine with peppermint, lavender, or cinnamon oil for a homemade insect repellent. The apple cider vinegar will raise the pH levels of your skin, causing mosquitos to fly in the other direction. Pour apple cider vinegar into a bottle. Add water before adding peppermint oil. Once you’ve combined all three, shake the solution until it’s mixed. Shake it every time you use it, as the oil may separate from the other ingredients. Apply it to the skin before you leave the house. Using various essential oils which repel and prevent bugs from biting can help keep mosquitoes at bay. Some of these oils are geranium, citronella, eucalyptus, lavender, and rosemary. Pair them with vodka as a disinfectant and use witch hazel for recovery, and you’ve got a DIY oil spray. Pour water, witch hazel, and vodka into a spray bottle. Mix in the essential oils. Shake the bottle until all the ingredients are combined. Shake before spraying. Lavender and lemon juice both contain chemical components that are effective at repelling mosquitos. Lemon juice contains citronella, which in potent levels can be an effective repellent against bugs. Take a small empty jar and place lavender oil, vanilla, and lemon juice into it. Shake the mixture until all of the ingredients are combined and then top it off with distilled water. Similarly to other recipes, this one includes eucalyptus and citronella which are known to be effective repellents. Add in cinnamon oil, which contains a strong scent, with the healing benefits of witch hazel and castor oil to make an excellent mosquito block. Take a small spray bottle and pour in witch hazel and castor oil. Add the rest of the essential oils into the container and mix well. Apply this to your skin before you leave the house. Fresh herbs are an excellent alternative when you don’t have access to essential oils. Most of these ingredients have low toxicity and contain properties that help repel insect populations. By mixing various herbs, you can use this mix on more than just mosquitoes. Chop all ingredients into tiny pieces. We recommend grinding the herbs to make a paste. Once you have all the ingredients ready, combine them in a jar and apply to dry skin. A balm can be an effective repellent as well as a powerful soothing topical. Beeswax, cocoa butter, and coconut oil are all powerful healing oils while the essential oils contain repelling properties. Take a small pan and heat it to low-medium heat and add in the beeswax pastilles, cocoa butter, and coconut oil. Mix until they are thoroughly combined and then add in the essential oils. Transfer the balm into a small Mason jar and apply it to the skin when needed. Another soothing recipe we’ve included is a bite stick you can take on the go. It uses coconut oil, beeswax pastilles, and a few essential oils such as peppermint and lavender. Peppermint is non-toxic, all natural, and is safe to use on sensitive skin. Take a microwave-safe bowl and add beeswax pastilles and coconut oil. Heat in 10-second intervals and mix the oils until melted. Add lavender and peppermint oil. Pour the mixture into empty chapstick tubes and allow them to sit overnight before applying. Other effective essential oils such as tea tree and geranium are known to repel mosquitos. Diluting it with vegetable glycerine and water allows you to spray it around your home and use it to keep flies away outside. Take a spray bottle and add water and vegetable glycerine. Next, add tea tree oil and geranium essential oil. Shake the bottle until combined. Spray around the house or on the skin to avoid bug bites. The main difference between homemade mosquito repellent and non-organic is whether you’re placing them in your home or on plants. When you’re using a topical, the non-organic and organic are similar in function. However, sprays and pesticides can be damaging to your home. Read any label on non-organic FDA approved pesticides and they will warn you of the dangers of using the sprays around pets and young children. We’ve listed a few different types of mosquito repellents. Some are applied directly onto the skin while others are designed to spray around your home. Everyone reacts differently to essential oils and each ingredient we use. Always do a spot test on the skin to see how you respond before you apply it liberally. Some common adverse reactions are itchy skin and red bumps. Recipes with vinegar, baking soda, and oil can help relieve some of the symptoms of bug bites. They may not be able to cure them, but they do help dry them out and prevent them from becoming more prominent and itchier. Generally, you can use homemade mosquito repellents for up to a week. If you’re using premium ingredients, consider putting them in a sealed container in the refrigerator. When it comes DIY mosquito repellent, it can be tricky to know which one to make. Hopefully, these homemade mosquito repellents help you on your next adventure outdoors. 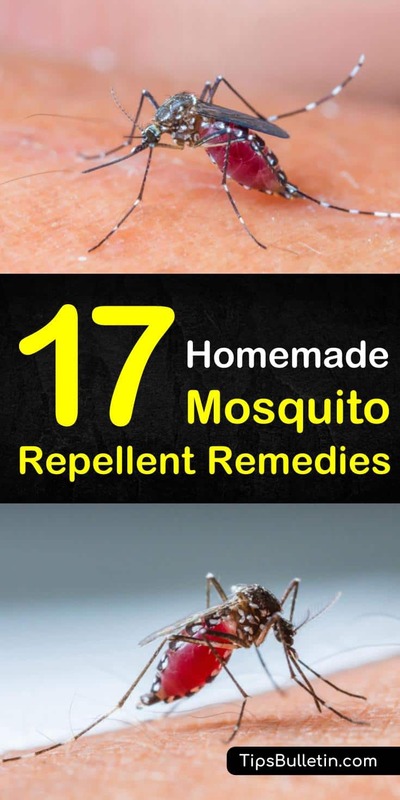 If you’ve found these mosquito repellent recipes useful, consider sharing them on Facebook and Pinterest.